I especially love the Raindrops on Rosettes PreCut Set of stamps. The floral spray is so beautiful and it stamps with such fine attention to detail that it has become one of my favourites. 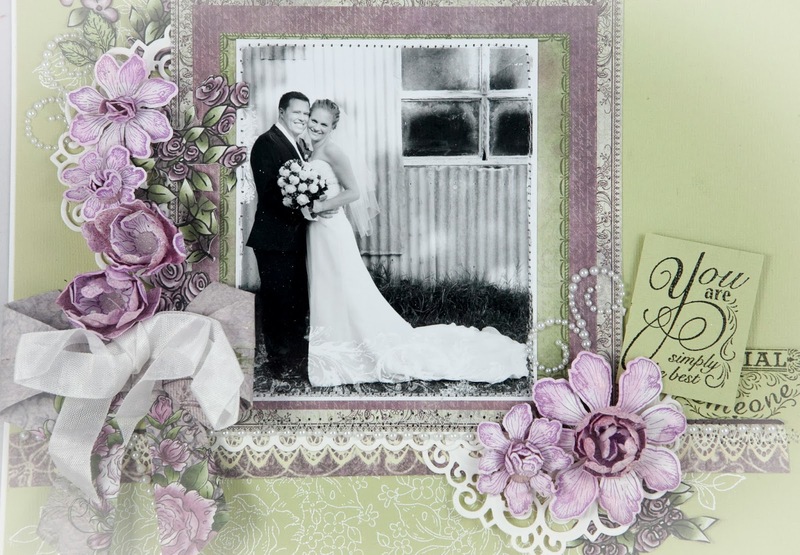 I used it to create the background in the wedding LO and here it adds some lovely detail and texture to the frame. 2. Stamp HCPC 3587 – Raindrops On Roses Window PreCut Set twice with black ink onto white card and heat emboss clear embossing enamel. 3. Cut out the shutters from one of the images. 4. Colour using your preferred method. 5. Use 3D foam tape and layer the shutters over the image. 6. Stamp ‘Thinking of you’ onto white card, trim and attach to the card with 3D foam tape. 8. Matt onto purple bazzill 4.75” x 4.75”, patterned paper 5.5 x 5.5” and 5.75 x 5.75” and finally 6 x 6” white bazzill. 9. 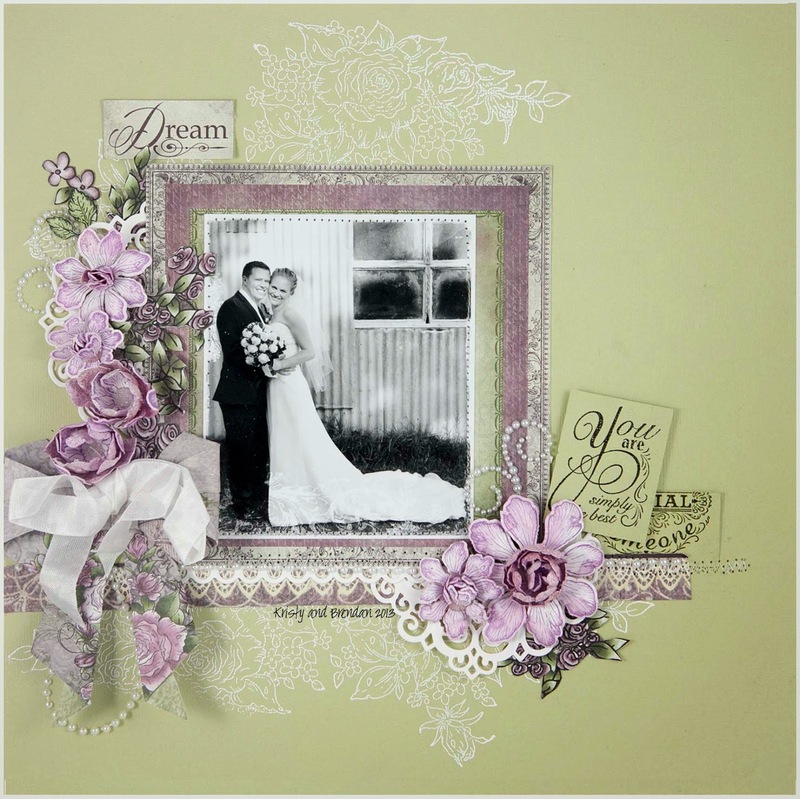 Stamp Tattered Blossom PreCut Set and cut out with the coordinating die HCD722 Tattered Blossoms Die. 10. Apply Viva Inka Gold Violet to the edge of the petals. 12. Stamp, cut and shape leaves. 13. 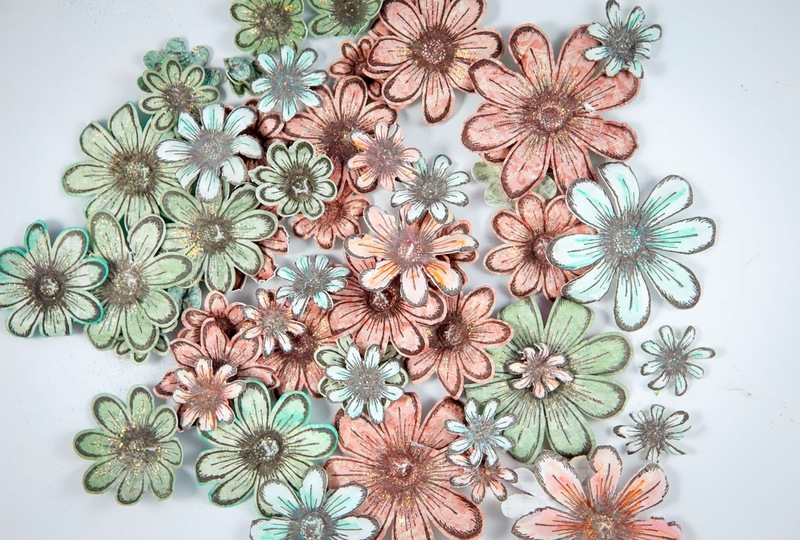 Assemble as shown in the photo and add diamond glaze to the small flowers around the window. Allow to dry. 2. 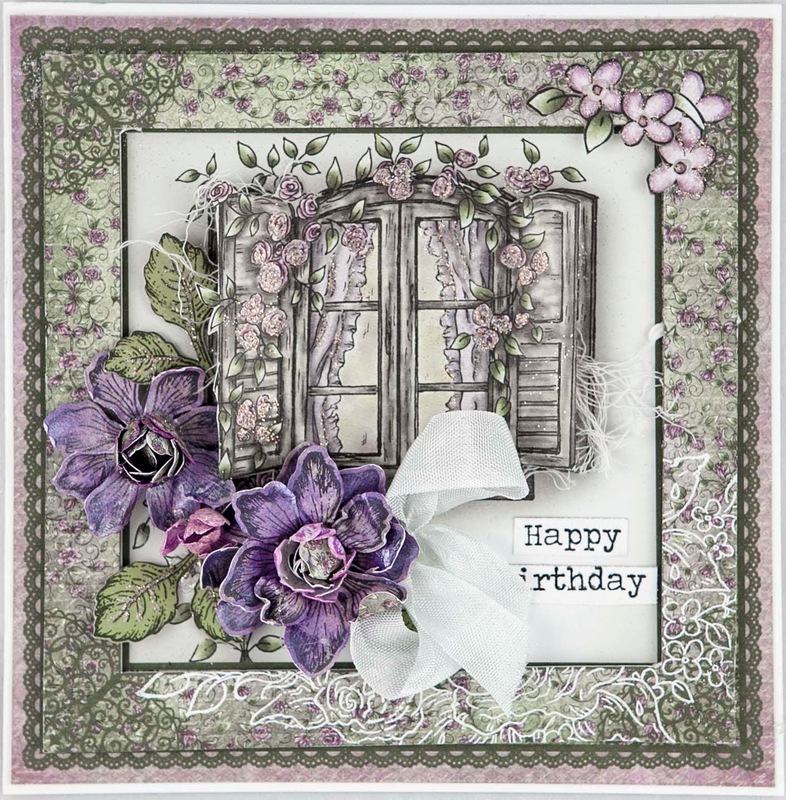 Cut out the 2 panels from the HCDP1 240 Raindrops on Roses Paper Collection with the window and cascading flowers. 3. Fussy cut out the window from one panel and attach it to the other window leaving the shutters free to move. (lay some cheesecloth underneath for more texture). 4. Cut out the frame from the collection and use a scalpel blade to carefully cut out the center. 5. Stamp HCPC 3585 Raindrops on Rosettes PreCut Set onto the frame with clear versa mark ink and heat emboss with white opaque embossing powder. 6. Use foam tape and 3D mount the frame over the window image. 7. 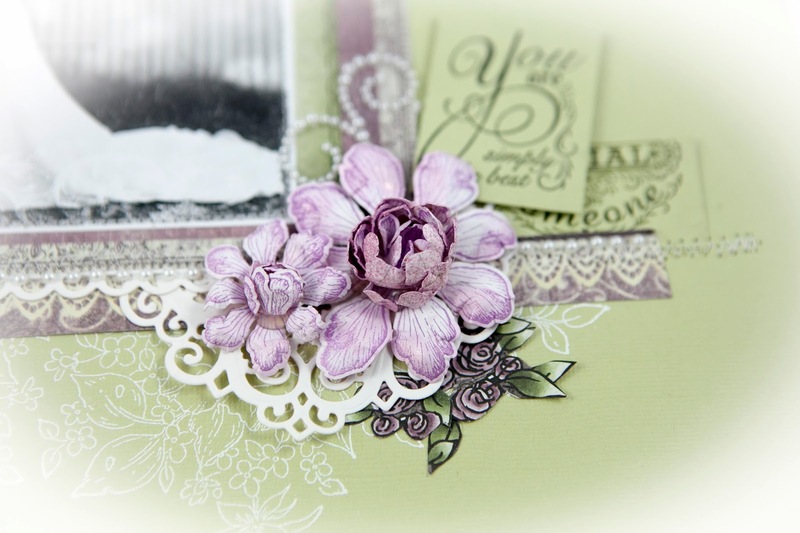 Stamp Tattered Blossom PreCut Set and cut out with the coordinating die HCD722 Tattered Blossoms Die. 8. Apply Viva Inka Gold Violet to the edge of the petals. 10. Stamp, cut and shape leaves. 11. Mount onto vertically folded 6 x 6” white bazzill. 12. 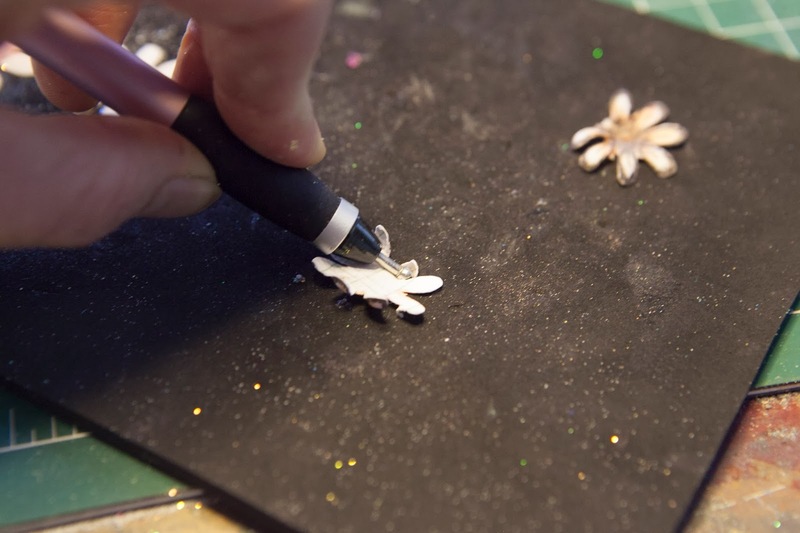 Use 352854 Metal Glue Tip and 159723 Art Institute Glue – Dries Clear to apply clear glitter. 13. Stamp Happy Birthday, trim and attach to the card. 14. Tie bow and glue under the flower. 2. 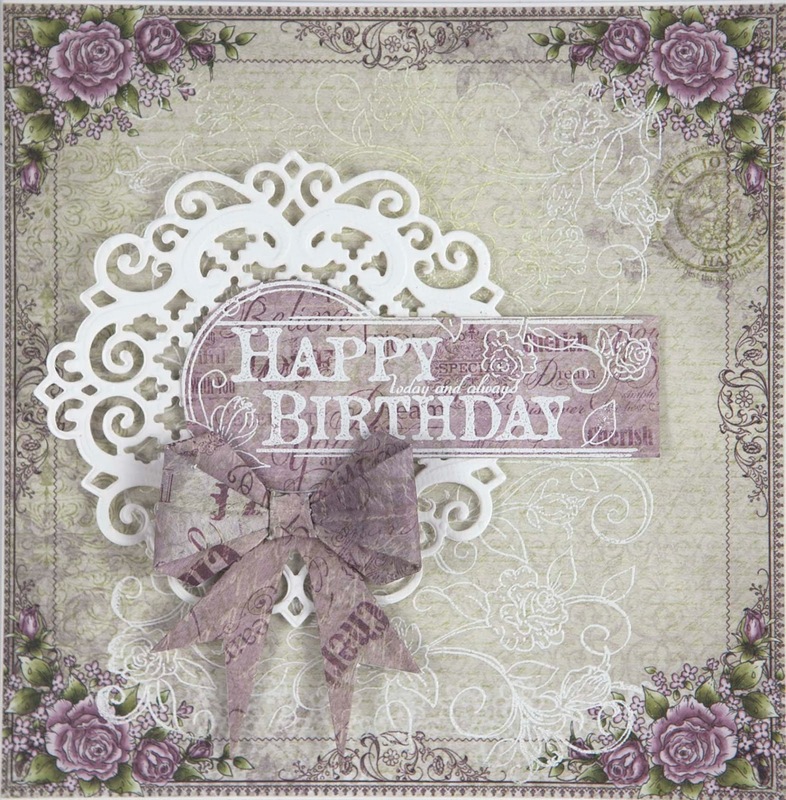 Stamp HCPC 3586– Raindrops On Roses Birthday PreCut Set twice with clear versa mark ink onto paper from the HCDP1 240 Raindrops on Roses Paper Collection. 3. Use opaque white embossing powder and heat emboss. 4. 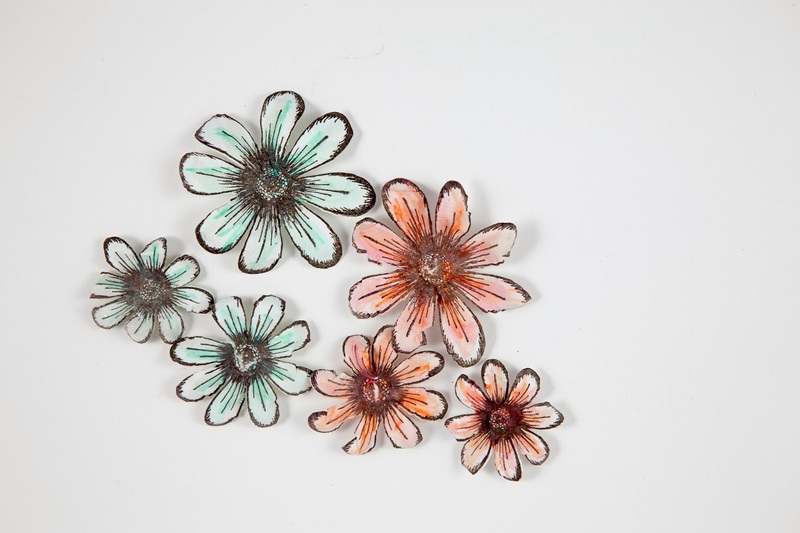 Cut out sentiment from the pink paper and attach to the circular cut out from HCD 743 Raindrops on Roses Die. 5. Assemble as shown in the photo. 6. Finish with a hand folded origami bow from 3.5 x 3.5” paper. See my blog for instructions to make the bow. The Raindrops on Roses Collection is scheduled to release on February 12th at 12 midnight. The decorative and intricacy of this die will enable you to create frames, borders, and endless opportunities for layering with your favorite images. 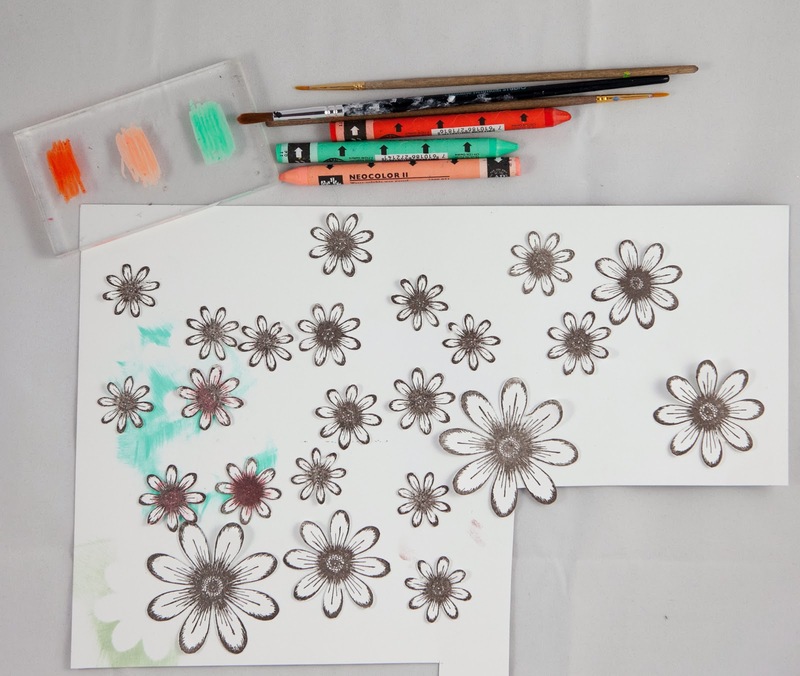 Pick up the classic image stamps to create a stunning masterpiece. 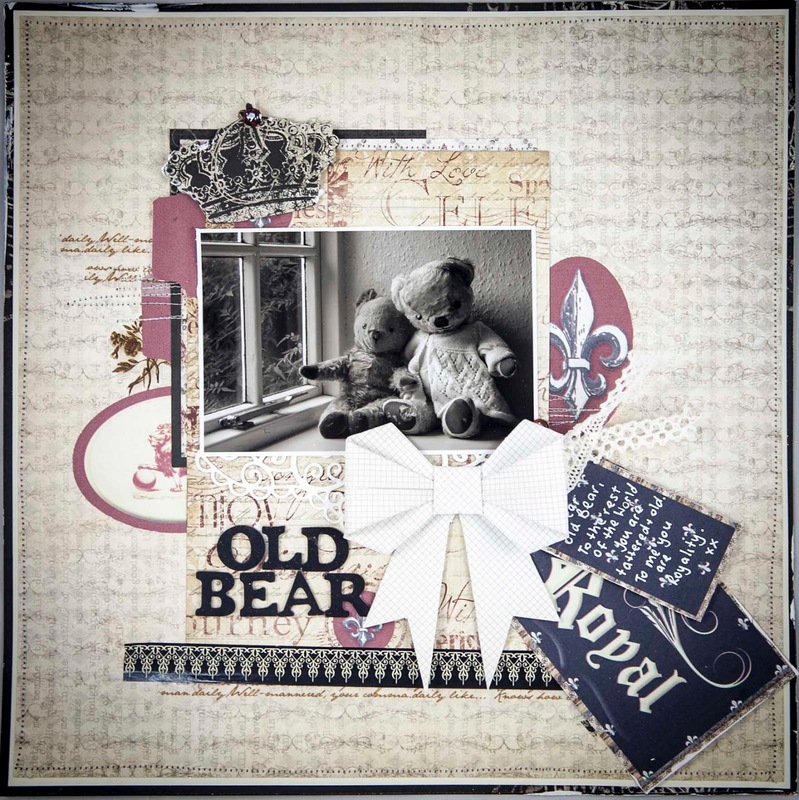 These background, accents and sentiment stamps will add a delightful classic touch to every project you create. The Raindrops on Roses paper pack is loaded with saturated greens and purples and sprinkled with colorful clusters of roses. 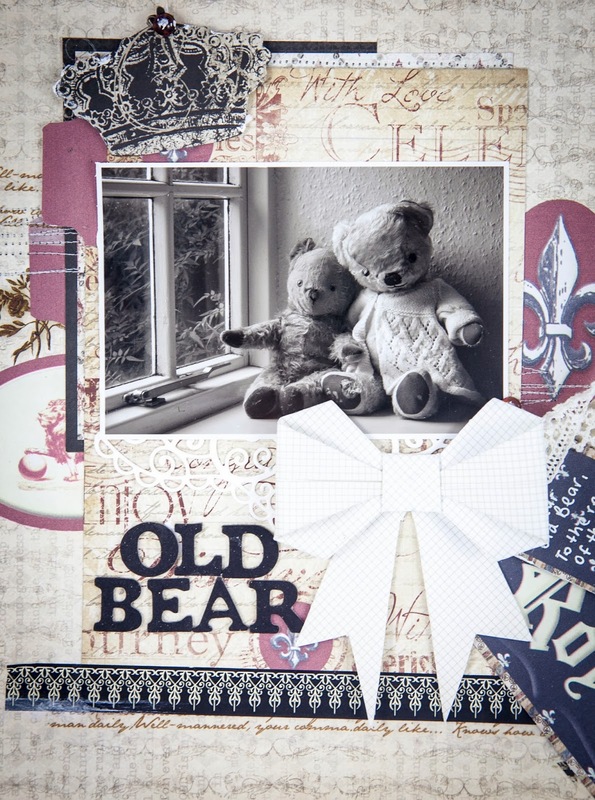 Card panels, 6x6 sheets, colored tags and journaling blocks will add the finishing touches to your projects. 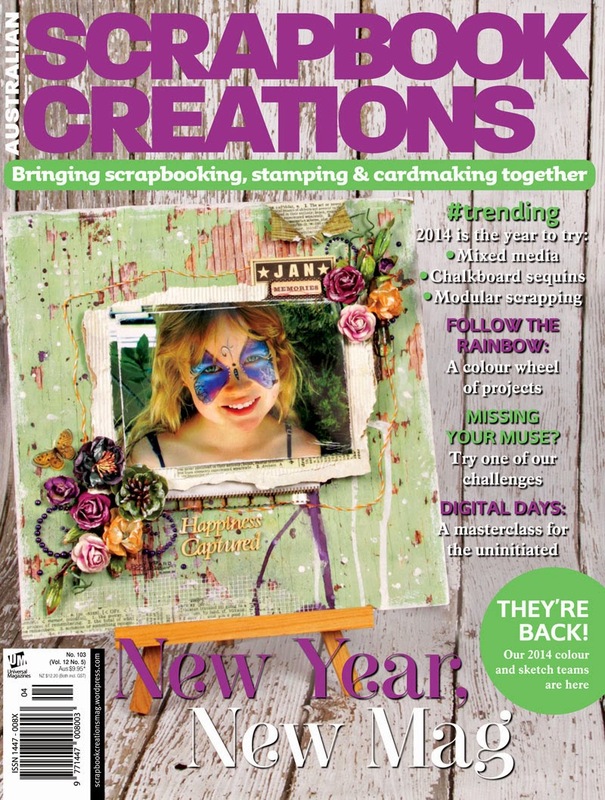 Have a look at Heartfelt Creations Blog for more inspiration. 2. Stamp HCPC 3585 Raindrops on Rosettes PreCut Set numerous times onto light green bazzill cardstock with clear Versamark ink and heat emboss with white embossing powder. (Use the photo as a guide). 3. Cut out 6” x 6” frame from the paper collection and a ½” x 10” strip of paper. 5. 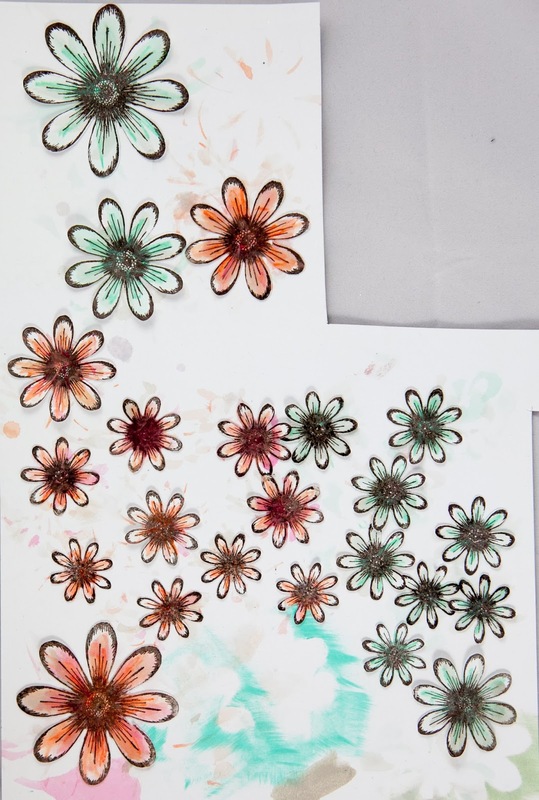 Stamp HCPC Tattered Blossoms PreCut Set with Brilliance ink and cut out with the coordinating die HCD722 Tattered Blossoms Die. 6. 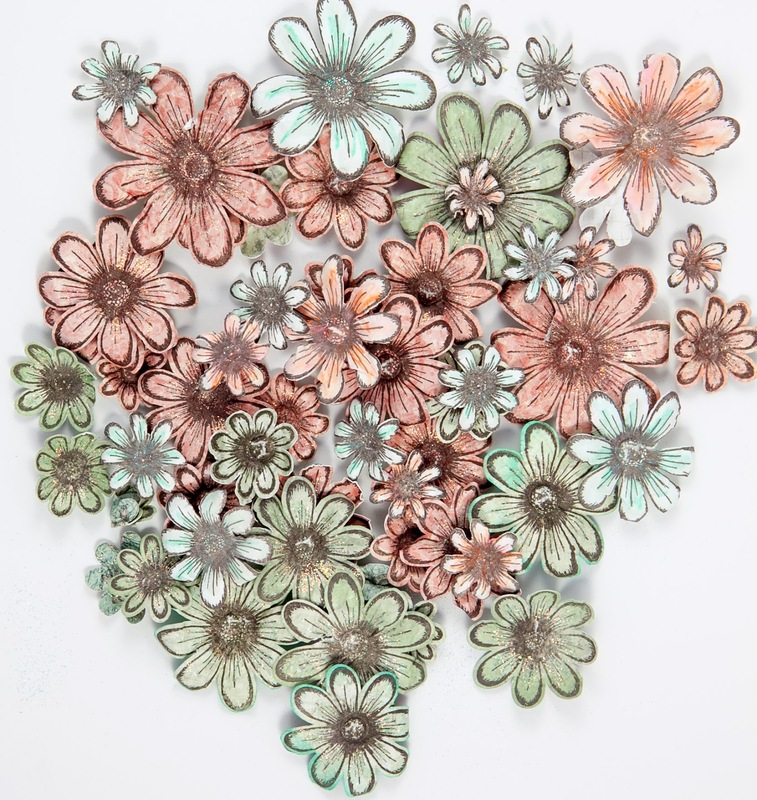 Wash the cut out petals with twinkling’s H2Os and shape and construct the flowers. 7. Cut 2 circular patterns from white bazzill using HCD 743 Raindrops on Roses Die. 8. Stamp sentiments from HCPC 3584 Lady Rosalie PreCut Set with black ink and clear heat emboss. Cut out around the words. 9. Machine sew around the edge of the photo and along the border. 11. Assemble LO as shown in the photo including bling, bling, fussy cut flowers. Today Heartfelt Creations and Robin's Nest have combined forces and are having a blog hop showcasing work using products from both companies. Pop over to Heartfelt Creations Blog and see more of the goodness for yourself. 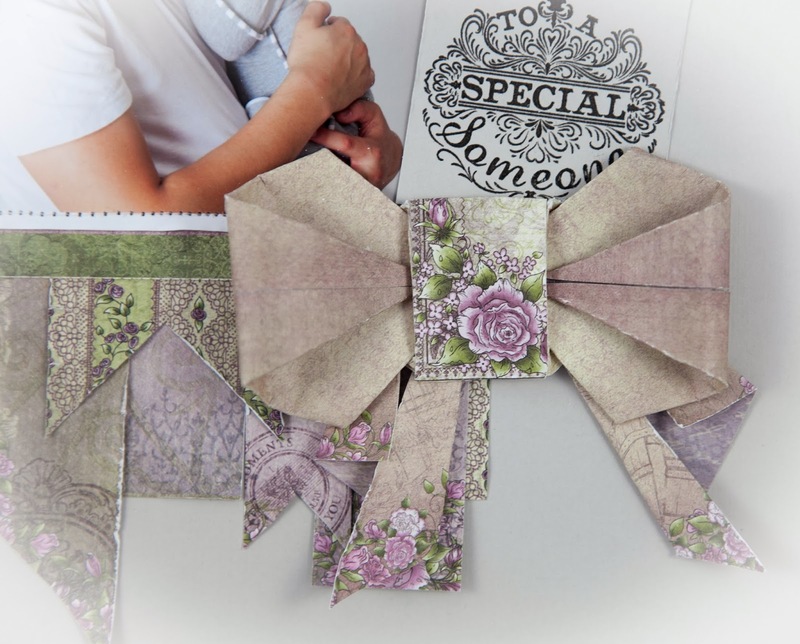 Click here to learn how to make your own origami bow. Robin’s Nest: Stickers Regency Tag Kit, Family Rub Ons and Tear Drops, cream and white bazzill, washi tapes, white pen, sewing machine and thread, white paint, 3D foam tape and Thickers black alphabet. 2. 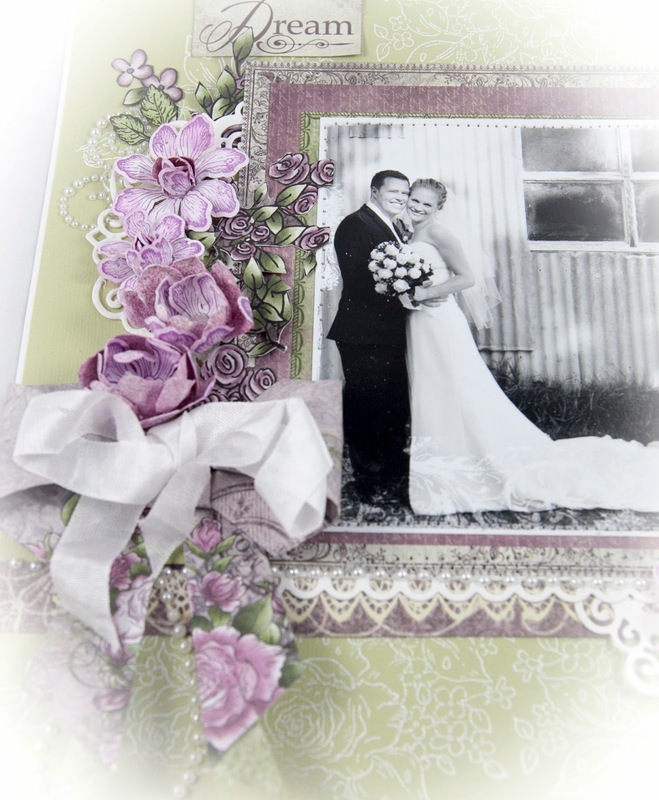 Create the background with the Antiquity pp and bazzill as shown in the photo and machine sew around the edges. 4. Place the following stickers: Lion, Fleur-de-Lis and tab. Also add Washi tape with text and the rub on as shown in the photo. 5. Overlay the mat from step 4 and machine sew zig-zags. 6. Cut 8 x 5.5” paper and add small Fleur-de-Lis stickers into the circles. 8. Cut out the Decorative Blossom Corner from white paper and place it under the photo so only the frilly base shows. 9. Add photo to the LO. 10. Cut out crown and use 3D mounting tape to adhere to the page. 11. 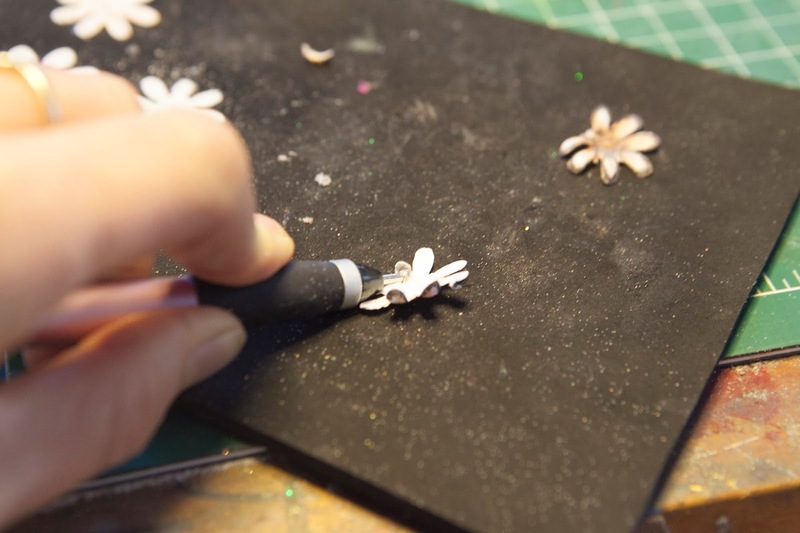 Place the Robin’s Nest jewel onto the top and dab with a little white paint. 12. Add title and the black washi tape along the base. 13. Mount tag stickers onto striped paper. 14. Punch a hole into the top of the small tag and thread through some coordinating lace. 15. Make an origami bow from a coordinating piece of white/cream paper. 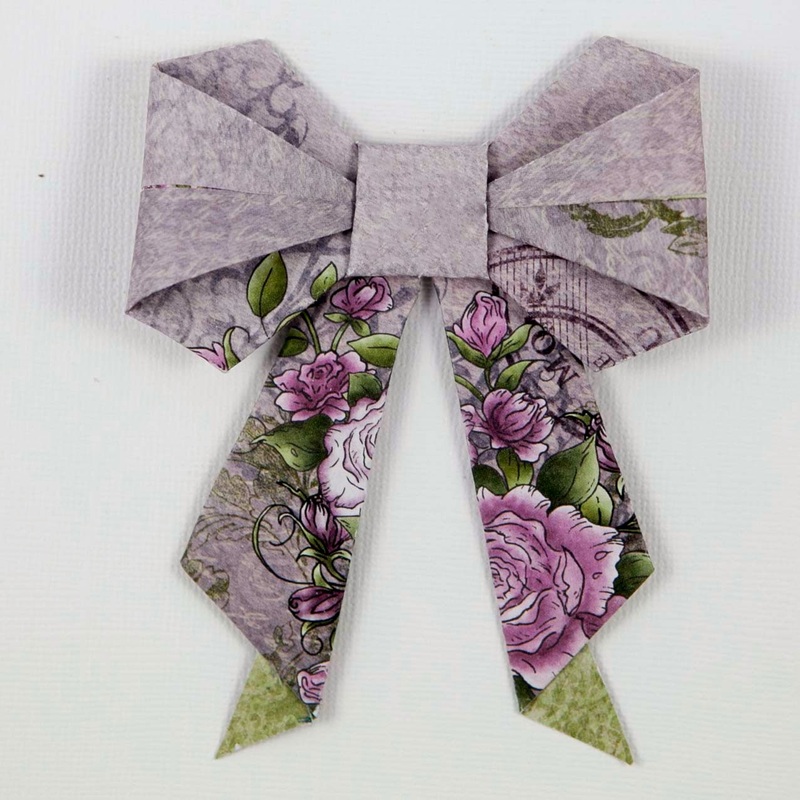 Click here to see how to make the bow. 16. Journal on the tag. Next week we will be releasing the new Febraury Collection for Heartfelt Creations 'Raindrops on Roses' and yes it is as gorgeous as it sounds.